The big three-oh, a small landmark for our Gwen Stacy. As I said before, the ending to last issue of Radioactive Spider-Gwen had me scratching my head, but the creative team has been on a roll, so I was mostly excited to see where this story went. Mostly. I also couldn’t help but be a little worried, since the meaning behind last issue’s cliffhanger was kind of up in the air. Is this truly 616 Gwen? More clone shenanigans, as she suggests? Or a different reality altogether? No matter what the answer may have turned out to be, I think the majority will agree that this is not a good direction for the story to take. No spoilers here. Spider-Gwen was finally back on track. Back in New York, on Earth-65 in her own book, no crossover underway, facing the root of her problems: Matt Murdock. He is where Spider-Gwen truly shines, and a confrontation between him and Gwen was long overdue. But now, it feels like it’s been postponed, and since there’s going to be at least another month until we find out why, it’s hard not to feel like it was for no good reason. Like our Gwen says, this seems like a distraction, and this issue’s cliffhanger gives us yet another one. I’m not going to completely write it off just yet, but this new arc better have a good reason for dragging us away from the Punisher + Kingpin climax we’ve been waiting so patiently for. For now, I’m interested, but I’m not sold. I’m also disappointed that this issue failed to expand upon Gwen’s perspective of 616 Gwen’s death that we heard about way back in #3. So far, it seems that her being stuck on another Earth with another Gwen doesn’t really matter. She could be stuck on another Earth with anyone. On one hand, there’s room to do this, since apparently this is a whole new arc, but the other hand, I don’t want this to be a whole new arc. I want to see Murdock’s teeth kicked in again! While I’d rather the story not take the turn that it has, I can still appreciate the opportunity that it has showed artist Robbi Rodriguez and colorist Rico Renzi to show off the range in their talents. Steve Ditko’s faces are emulated but not copied, leaving room for Rodriguez’s flair to fill in the blanks. In addition, Gwen herself is considerably lighter than the people around her and her environment this time around. I know Renzi likes to go out of his way to make anywhere that isn’t 8 or 65 look bland in comparison, and that’s why Gwen sticks out so much here. She’s a strong contrast between what we know and an update on what once was. It would have been easy to just give this Gwen minimal differences from our own, but the artists went above and beyond to give us the sense that our protagonist is indeed out of place and doesn’t belong here. My only complaint is that heads can be a little wonky, but most of the time, they look great and match up well with the rest. 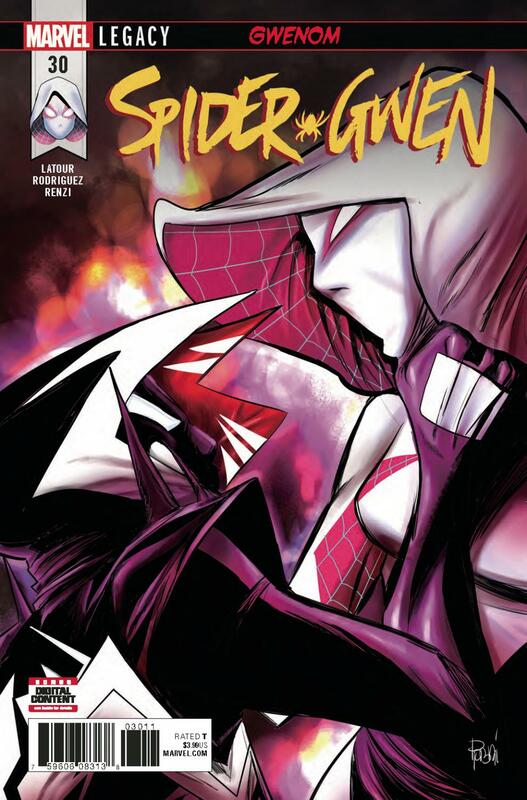 So Spider-Gwen #30 is a bit of a mixed bag for me. What progress that story makes is fine on its own, but when we’ve all been looking forward to the Kingpin showdown for so long, we’re bound to feel a little sour when it’s postponed. At least until we get more answers, I think most will agree that this arc should have waited until after, unless it does somehow come full circle and wraps into the Kingpin’s schemes, in which case, uh….why? If you’ve been up to date on Spider-Gwen, this is still worth your time. Just be prepared to deal with some other things before you get what you want.